Last September I attended my very first knitting conference/festival thingy: Knitters Day Out, near Harrisburg, Pennsylvania. Ever since I first learned of KDO a few years ago, it’s managed to land on the same weekend as my wedding anniversary, and last fall was the first time the two events were several days apart. My morning class was on knitting a top-down raglan. The instructor was not as organized as I’d have liked and padded her income a bit by charging us a $13 “materials fee” for a mini notebook from CVS, four pages of photocopies, a paper folder, and a skein of acrylic worsted yarn. (We also wasted spent the first forty-five minutes of the three-hour class knitting gauge swatches—which we could have done at home ahead of time.) Each student was asked to bring an eight-inch tall stuffed bear to class. 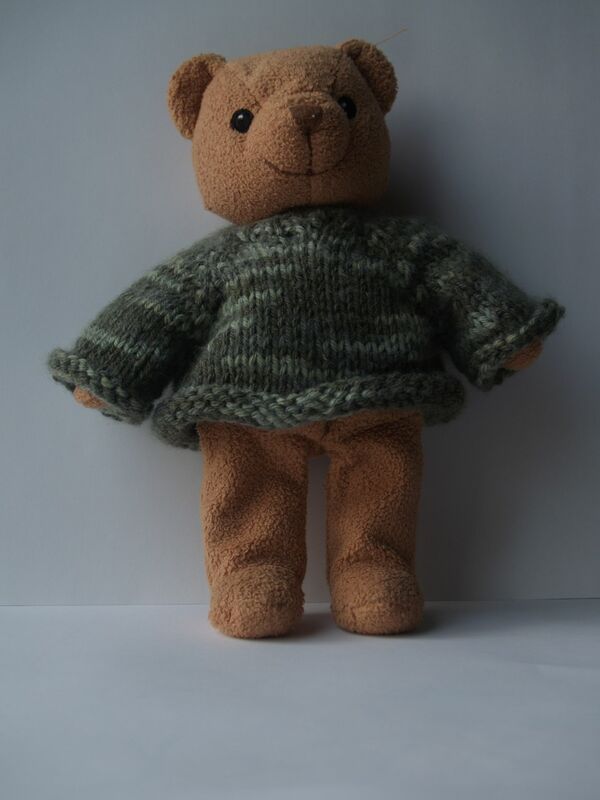 I borrowed Sylvia’s bear Tiny Teddy and learned how to measure for this type of sweater. I knit most of this sweater during the class and finished up the rest a few days later. 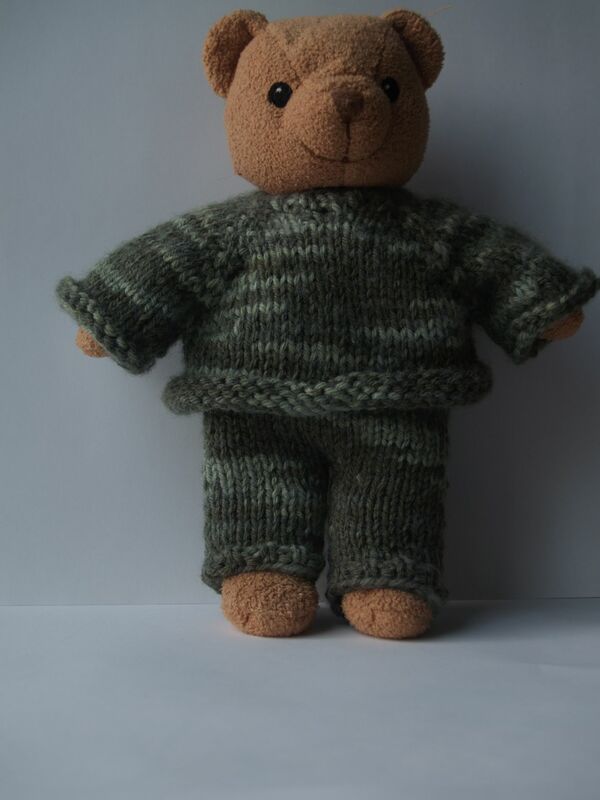 I thought he looked a little sad with just a sweater, so I knit him some pants, too. No pattern—I just winged it. I think they turned out nicely! Tiny Teddy hasn’t complained about them, at least. My afternoon class was on finishing techniques. The instructor, Margaret Fisher, was amazing: knowledgeable, articulate, professional, and efficient. Given the opportunity, I would take any class with her—even this one again. (She just published her first book: Seven Things that Can “Make or Break” a Sweater . It was another one of my Christmas gifts, and I highly recommend it.) We learned about the tubular cast-on and the tubular bind-off and short rows…and we learned how to (gasp!) cut our knitting to lengthen it. There’s something rather unsettling about wielding a pair of scissors and snipping away at something that took a while to knit. But Margaret talked us through it, and the results were pretty amazing. KDO is held about 90 minutes from my house, so it’s an easy day trip there. I carpooled with three friends, and we arrived early enough to browse the market before our classes. When we picked up our registration materials, we learned that we’d each won a door prize. Mine was a $25 gift certificate for one of the market vendors, Bearlin Acres Farm. I stopped by there during the midday break and found myself facing an incredible array of locally grown, spun, and dyed yarn. I had a lovely chat with the owner (whose name escapes me, I’m afraid), and when she learned that I was the person who’d won her gift certificate, she became very interested in seeing what I chose. After much deliberation, I decided on two four-ounce skeins of her hand-dyed Cheviot/Alpaca blend (50% wool/50%alpaca) two-ply sockweight yarn. They were $13 each, so I was set to add a couple of dollars to my gift certificate. I told her I was going to use the yarn to make something for my purple-crazy daughter and asked which yarns in her stock would go well with the purple I’d chosen. She replied, “Anything would work, I think! Look around and see what you like. And you know what? Get three skeins. It’s on me.” Wow. How amazingly nice. I know what it is! It’s worth the trip back everyone! Marsha- I once in a while check our listings on Google for the farm. I ran across your blog today. THank you for the kind words regarding KDO. It’s a treat to find someone who appreciates our flock for what they do well! …and more is growing as I type. Have a great year and let me now what you did do with the yarns! Happy New Year! I love the teddy sweater and pants! I can’t wait to see what you made for Sylvia. My daughter just turned 14 and she still is purple crazy. Thanks for the recommends! Glad that you had a good knitting escape trip, and will be tuning in indeed to see what becomes of your newly acquired yarn. Happy New Year! I love knitting top-down sweaters! Knitting Pure & Simple has a lot of different top-down sweaters.